raw, or they prepared meals for their dogs using ingredients from the same sources that they would use for themselves. (Not necessarily the same ingredients, though, as they would use such great by-products as lungs, stomachs, udder, and connective tissue to feed their dogs.) Also, dogs were not routinely spayed or neutered at an early age. During my first two weeks in the USA, however, I personally met two dogs dying from cancer. I thought it was a coincidence, but I was shocked to find out how many pet owners have lost dogs to this disease, as well as were battling many chronic conditions in their dogs, including kidney, liver, and digestive problems, allergies, really poor dental health, etc. All of them fed commercial brands of dog food, sometimes those recommended by their vet. Vets go to school to study the internal systems of many different types of animals and birds. They also study different animal diseases and how to treat them. They are doctors, not necessarily nutritional experts. Their focus is in helping sick or injured animals, not how to produce healthy, top quality dogs with outstanding coats, joints, bones, skin etc, which can perform at shows and trials, or be used in a breeding program. Its typically top breeders and show people that have the benefit of years of experience in raising and researching one specific breed of dogs. Also, most vets usually have only a very general idea about the proper weight of the German Shepherd Dog. They usually dont have breed specific information and may have limited knowledge of how a German Shepherd puppy develops differently from other breeds of dogs. Most vets, when seeing a German Shepherd puppy in a healthy, fit condition will advise the owner to put some weight onem. Dont do it! And also dont follow suggested feeding amounts on your bag of dog food. Most often you have to cut that amount almost in half for your German Shepherd puppy. 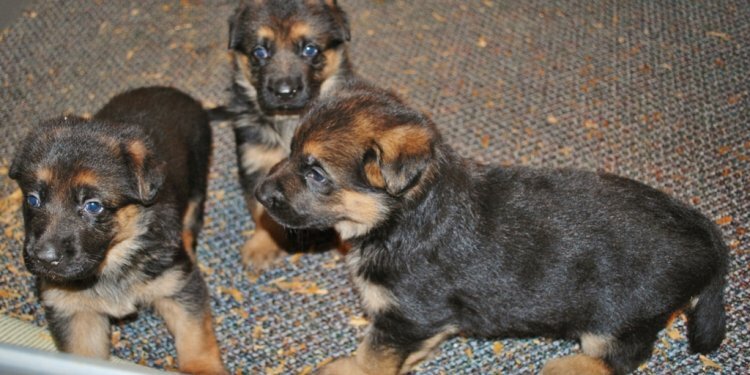 German Shepherd puppies need to stay very lean while growing. They will grow large, and strong, and fit. If you like a heavier dog, you will always be able to let him "fill in" later, but please do not destroy his growing joints with excess weight during the early growth period. So, back to feeding your dog. Of course everyone knows that a dog is a carnivore. If you only take a look at a dogs digestive system, the teeth and skull anatomy, and the way they are built, it becomes very clear that these animals have developed to tear their food off, shear it, not chew or crush it as a cow, horse, or a human would. They have sharp pointed teeth, strong jaw musculature, and dont have any digestive enzymes in their mouth as humans, for example, do. When they chew things, they only do so to cut their food down into pieces small enough to swallow. Being carnivores, dogs have a very difficult time digesting grains. Animals that evolved to digest grains and whose primary dietary component is carbohydrates, have intestines two-three times longer than that of a dog, and they often pre-digest their food while chewing it. They also have different enzymes and acidity levels in their stomach. So when pet food companies use soy in their products, it increases the amount of protein that they can put on the label, but how much of that plant protein will your dog be able to use? When you feed your dog raw foods such as meat with bones, fat, and organ parts, your dog digests this raw food completely in about 3-5 hours, producing very small stools. When you feed your dog grain-loaded kibble, it may sit in the digestive tract for up to 15 hours, all along poisoning your dogs system, undermining his immune system, thus predisposing him to cancer and allergies, as well as creating the perfect breeding grounds for worms and other parasites. Feeding your dog kibble is no doubt very convenient, just like eating in a fast food restaurant. Sure we all can survive a Big Mac now and then, but imagine eating fast food every day of your life, all your life. What kind of health would you have? What kind of health can you expect your dog to have when feeding him doggy fast food kibble? There are high quality kinds of kibble available now that dont use wheat, soy, corn, etc. They are much better than your typical commercial dog food, but they are still over-processed and "dead." There is nothing that can substitute for a raw meat diet for your dog  you will never get complete amino-acids, enzymes and vitamins that your dog needs for his digestion, immune system and clean teeth from cooked, ove-processed commercial dog food. Due to the numerous health problems that arise from feeding commercial dog food, and also due to the recent unfortunate deaths of many dogs because of tainted food, I feel it is necessary to share how we feed our dogs raw, not only with my puppy owners, but with anyone interested to educate themselves on the subject. Feeding raw might be a little more time consuming than just filling a bowl with kibble, especially in the beginning, but as you get into a routine of doing it and establish reliable sources of your raw ingredients, it really becomes just about as easy. The base of our dogs' diet is chicken. It is inexpensive, readily available, easy for dogs to digest, and is a great source of bones and fat. Bones, fat, and organs are just as important in your dogs raw diet as the muscle meat itself. Feeding skinless chicken breast is not a complete raw diet! I try to go by the ratio of approximately 25% bone, 20% fat, 15% organs, 35% lean muscle meat, 5% fruits and vegetables for my adult dogs, and a bit more veggies and variety of other foods for puppies. Below is an approximate raw menu that you can use as a guideline. The great thing about feeding raw is that you don't have to perfectly balance every single meal for your dog. I know some of you have the horrifying picture of spending hours grinding and mixing endless bloody ingredients, trying to achieve perfect percentages, and worrying that you are out of liver today. Feeding raw is much simpler. Whatever type of raw food you have today, just hand it to your dog. Over time, say over a week, try to provide variety and balance. When raising a puppy, I start each morning with a short, 2-5 minutes training session, and use boiled beef liver as treats (cut into small cubes). I use a lot of treats in the beginning, therefore the following breakfast is light. When short on time, I simply scatter the treats in the grass to have the puppy search for it. I recently picked this idea up from the 2009 WUSV SchH3 Champion Sharon Ronen (Israel) at our club's seminar. She never feeds her working prospect puppy from a bowl! The amounts of food that I suggest here are for an 8-weeks old puppy. As your puppy grows, start increasing the amounts gradually, so that by the age of 16 weeks he is eating about twice as much. For example, if it sais to give 1 small chicken back to an 8 weeks old puppy, then the amount to give to a 16-weeks old is 2 small backs, etc. Please don't feed two chicken backs in one feeding to an 8-10 weeks old pup, that's just way too much. Also, constantly monitor your puppy's condition (the amount of fat on his ribs). If in doubt, it's better to err on the thinner side! If the puppy is a little too chubby, decrease the amount of food he is getting for at least a week. Every other morning I give the following mix: 3 tbsp. of + 3 tbsp. of plain all natural yogurt + 2 tbsp. freshly ground apple (or , sweet potato, banana, blueberries, or other fruits and vegetables. Twice a week add 1 to this meal. The that we use is "Friendship, " no salt added. I'm sure there are other good brands, but make sure that the ingredients are: milk. That is what cottage cheese is made out of, and there must be nothing else, except maybe for some vitamins. This is important for you too, go for pure products for your family as well.